A simple to use package that is rammed with features. Highly recommended. More detailed channel metering would be welcome. 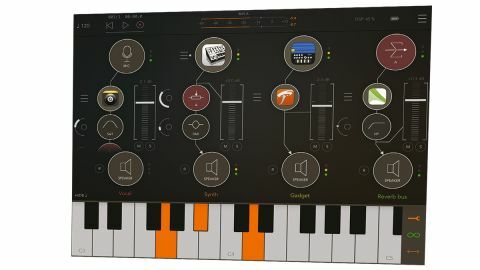 Thanks to AudioBus and Inter-App Audio, shuttling audio signals between apps within or alongside your iPhone or iPad DAW has become an intrinsic part of the mobile music production process. AUM, by Jonatan Liljedahl, developer of Sector, however, aims to take that concept and run with it, serving as a veritable Swiss army knife of signal manipulation. Fundamentally, AUM is a mixer, enabling you to set up as many channels as your device can handle, each with an input at the top, an output at the bottom, and limitless insert and auxiliary send points in between. The list of inputs comprises hardware (built-in microphone and connected audio interface), AU extensions, Inter-App Audio/AudioBus apps, an AudioShare File Player, and eight internal Mix Buses; while outputs can be hardware (headphones or audio interface), one of four IAA or AudioBus outs (ideal for feeding into separate channels in a DAW), or one of the aforementioned Mix Buses. Each insert point can host an AU Extension, Inter-App Audio effect, one of a handful of built-in processors (EQ/ filtering, dynamics and various useful stereo/mid-side utilities), or a Bus Send, and tapped pre or post fader. A level fader, and Mute/Solo and record arm buttons complete the channel strip; the latter lets you record on multiple channels direct to AudioShare. MIDI is fully catered to as well, with assignment of physical MIDI inputs and the onboard virtual keyboard to any and all available destinations made using an intuitive matrix, and MIDI CCs assignable to AUM's own controls and those of loaded AU Extensions. Ableton Link is in place, too. Bringing together all of iOS' most useful audio and MIDI routing protocols in a robust, easy-to-use 'hub', AUM is an unreserved must-have for live performers, and well worth investigating by producers looking to expand on the facilities of their iOS DAW. It doesn't hurt that its sharp vector graphics look awesome, either, although our only (minor) criticism is that it could do with more detailed channel metering.